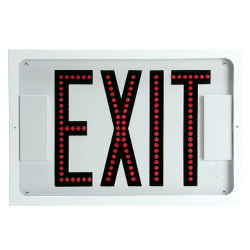 Exitronix's LED exit combo signs combine an appealing design with the added functionality of LED emergency lights. The VEX-WPCR Series exit combo’s low-profile, rounded corners and compact size give the unit its modern design. The VEX-WPCR is UL 924 Listed for Wet Locations and features remote capability. 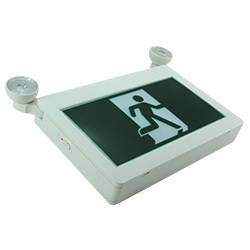 The unit is an ideal solution for egress lighting where splashing, dripping or non-corrosive liquids may occur. 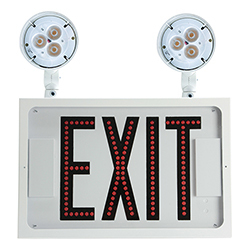 The Tempo Pro ultracompact LED combo exit sign provides a more complete, compact, powerful light offering with a higher performance than most currently on the market. 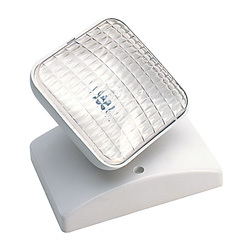 The VLED-EL90 Series combines LED exit illumination with reliable LED lamp heads. The attractive, low-profile design offers maintenance-free, long-life dependable service and easily mounts above doors and in restricted spaces to fit any application. 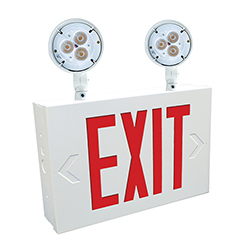 The VEXCL-8 Series New York City Approved steel combination LED exit offers energy-efficient LED illumination and reliable emergency lighting in a durable steel enclosure. The VEXCL-8 is ideal for any commercial, institutional or industrial application. 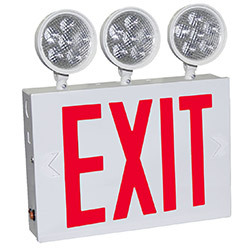 The VEX-WPC Series LED exit combo sign is engineered to perform in the most extreme environments. A fully gasketed polycarbonate lens and 5VA housing enable the VEX-WPC to be installed in locations that require Wet Location rated protection. 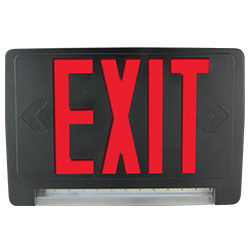 Attractive and easy to install, the RMPC Series running man plastic exit combo sign combines quality LED illumination with contemporary soft corner styling to complement any application. 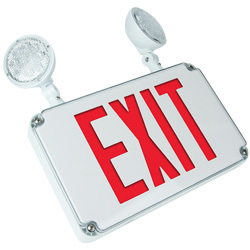 Universal mounting and included pictograms make this versatile sign perfect for any application or installation. 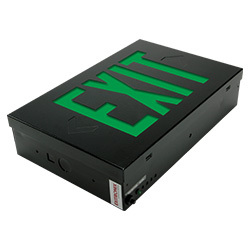 The NAV-C Series vandal-resistant LED combination exit sign is designed to stand up to high-abuse areas such as correctional facilities, schools, apartment complexes and public areas that may be subject to vandalism. The NAV-C features an IEC IP66 rating standard and is suitable for wet or hose down applications. 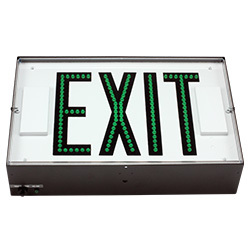 The 700E Series steel LED exit sign features high-intensity red or green LEDs for bright and uniform illumination, while the 20 gauge steel enclosure offers durability and strength. 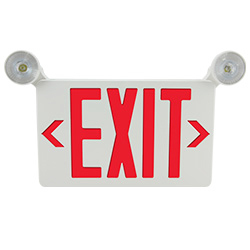 The 600E Series steel, direct view, LED exit sign provides bright illumination in both normal and smoke-filled environments. 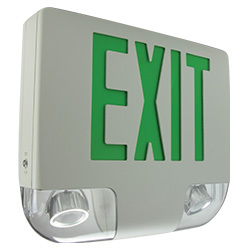 The 500E Series steel, direct view, LED exit sign provides bright illumination in both normal and smoke-filled environments. 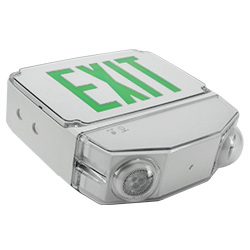 The 400C Series aluminum LED exit/emergency combo unit combines an appealing design, the latest in die-cast technology, and high-performance electronics to ensure reliability. The Revolution Series offers maintenance-free, long-life, dependable service and easily mounts above doors and in restricted spaces to fit any application. 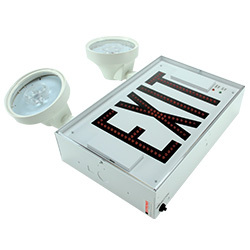 Unique "Light Bar" design combines LED exit illumination with reliable, low-profile LED emergency lighting. The ER-KIT Series pendant extension rod kit is available in 1' or 2' lengths as well as white, black or brushed aluminum finishes. 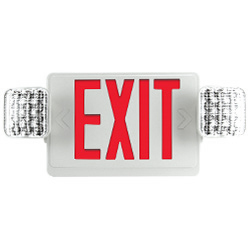 Vandal-resistant wire guards protect emergency lighting equipment against accidental or intentional abuse. 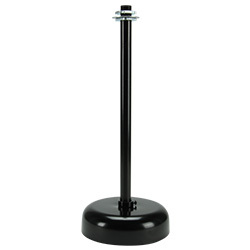 Ideal for high-traffic areas such as schools, gymnasiums, parking garages, warehouses and public areas.